Flash is a hero who's always been popular in the DC Universe. More so after the recent success of the TV show starred by Grant Gustin, going for its third season on CW. I even think the Rebirth Barry Allen design was inspired in the actor. Anyway, we're back to the basics, but not in a basic way. In the beginning of the issue we see a murder of a mother, whose witness was her only son and her husband is the main suspect in the case. It seems that we're about the see Barry's origin retold, but it is soon revealed as just a similar case and Barry, as a CSI, is up to investigate the mystery. 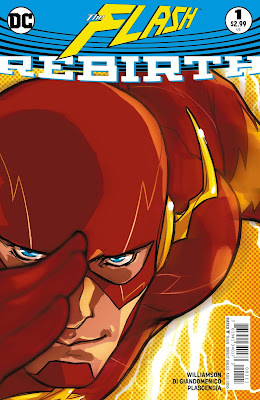 However, that's not the only mystery Barry has to put up with: his life as Flash has suffered a turning point with Wally West's return in the one-shot DC Universe Rebirth and now he has all his memories, once erased by a major, yet hidden, force, back to him. What does it bring to Barry's reality, though? We're not dealing with a starting point for the new Flash series, but with an immediate sequel to the Rebirth Special. 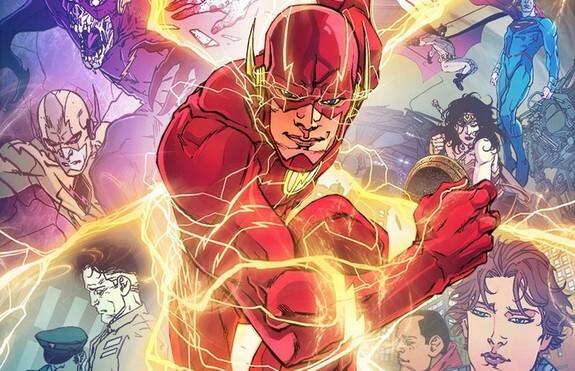 What is happening to both Wally and Barry as speedsters is explained and also give us a hint of what the pair will do to try to recover the other heroes' memories. Also, Flash advises Wally to get a new uniform and a new alias, as he goes his way to find the Titans and Barry goes to the only person he thinks is able to help him now: The Batman. Not a lot of surprises here, not many revelations either. But Carmine Di Giandomenico, the artist in charge of the new series, shows why he was an obvious choice for the job. His artistic style blends well with the character's atmosphere. The way the Flash is conceived, with the streaks of energy running all over his body is incredible, and he will for sure make a good partnership with Joshua Williamson, who seems to understand the material he's writing for quite well. Well enough to deliver good interactions between the characters and take Barry's charisma to another lever. Although for me this issue works as an ending for the Barry/Wally re-encounter, it gave me some good feeling about this upcoming series. Flash is part of what I love about DC Comics!